Welcome to the Winston-Salem area of North Carolina, historical area for many past and present Poindexter family generations and ancestors. Home to Revolutionary War officer, Captain Thomas Poindexter III and his wife Elizabeth “Betty” Pledge Poindexter. 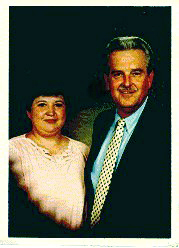 We are Al and Cathy Hill, chairpersons of the 2006 Reunion Committee. We have a load of activities planned, including historical and genealogical presentations, visits to historical Poindexter sites (including the site where Captain Thomas Poindexter and his wife, Elizabeth “Betty” Pledge Poindexter, the granddaughter of Chief Donnaha, lived and are buried), Donnaha Railroad Station Site (name in honor of Chief Donnaha), other Poindexter homes, a lot more fun activities, and some Good Ole’ North Carolina food, including world known Lexington-Style Hickory Smoked Barbeque! Check the Agenda to see what all we have in store for you. Winston-Salem, Forsyth and Yadkin Counties are full of history, arts and culture, from Old Salem, and one of the original Moravian settlements. Also in the area is the Reynolda House, the home place of Richard Joshua (R. J.) Reynolds, the tobacco magnet, and now the renowned Southeastern American Art Museum. While you're here, in the area, plan some side trips and visit all that we have to offer. If you have any questions or special needs, be sure to indicate them on your registration form. And don't forget to reserve your hotel room by by May 20, 2006, for special rates. Questions about the WInston-Salem area? Click on the "About the Area" link at left or feel free to contact us. You can email Al at hillam@wfu.edu or Cathy at cathyscrafts@alltel.net, or call us at 336-377-2954.